3. It keeps right and left lever machines in parallel alignment. 4. It serves as a stopping means for each lever machine. 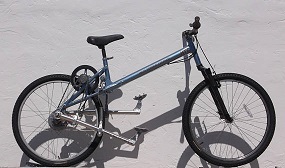 An improved lever propelled bicycle that provides the rider with the means of low pedaling resistance due to no rotation of the pedal, thus voiding out the fluctuation in force needed to pedal the bicycle forward. A pedal on a conventional bicycle changes its position in proximity to the fulcrum of the crank sprocket as it rotates. The lever enhance pedaling systems with elevated crank sprockets maintains a linear curve, thus reducing the fluctuation in effort needed to propel the bicycle. The vertical spring around the reciprocal cable on the opposite side of the pressed pedal contracts, while absorbing the shock of the downward pedal when it is pressed to its lowest pivotal point, then gives energy back to the leg, while causing it to bounce up to reposition or raise the foot upward for future downward pedaling. This repetition of downward pedaling and energy return would happen on both pedals as each pedal reciprocate in opposite directions up and down. The propulsion chain is positioned midway on the lever machine between the fulcrum and pedal. However, this chain position is located closer to the fulcrum giving the rider more mechanized leverage. So if the rider pedals the bicycle when it is a single speed or the internal gear hub ratio is 1 to 1, the rider’s downward weight on the pedal should give an output of over twice the rider’s weight. Furthermore, an internal multispeed hub within the rear wheel would allow the rider to increase his or her speed simply by changing the gear ratio at the right handle bar grip. Page created at 2019-04-26 6:38:26, Patent Auction Time.